Despite the unfortunate cultural overtones, Thanksgiving remains one of my favorite holidays. This is probably because it does not require any non-grocery shopping, a holiday for which one is not expected to bring or receive gifts, nor to dress in costumes, but only to enjoy preparing, serving and eating delicious food. Sharing favorite recipes and memories helps me feel a spirit of kinship with everyone at the table; young and old, progressive and conservative, old friends and new additions. 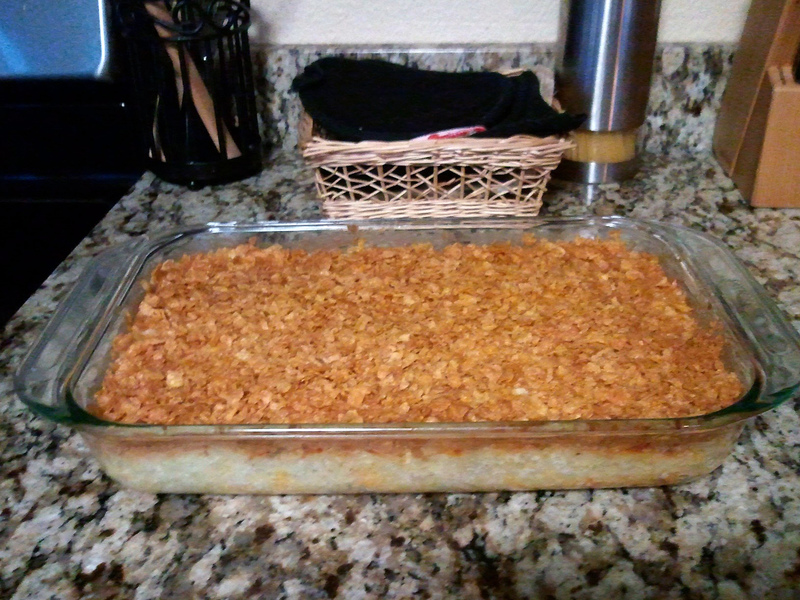 Cheesy potato casserole is a classic of the genre, designed to be assembled quickly and satisfy a crowd. The only fresh ingredients are dairy-based and no potato peeling or slicing is required due to the secret ingredient: frozen country-style hash browns. I picked up the recipe at my cousin’s wedding back home. Family members chipped in together to provide the reception buffet dinner. My mother made a huge roast beef, the groom’s father made chicken salad croissant sandwiches, and my aunt made tray after tray of this sour cream dream. There are many variations of the basic Cheesy Potatoes recipe. I made mine vegetarian with cream of mushroom soup and mixed Emmentaler cheese in with the cheddar. Of course, these tweaks likely mean it’s less authentically midwestern, but then so am I. Every school child should know that the Pilgrims did not live on packaged carbohydrates and dairy fats alone. This bountiful continent they invaded also provided a wealth of delicious, even nutritious vegetables, some of them not known as maize. I’ve been eating a lot of autumn curries lately at Thai restaurants and enjoying the silken sweetness of squash. 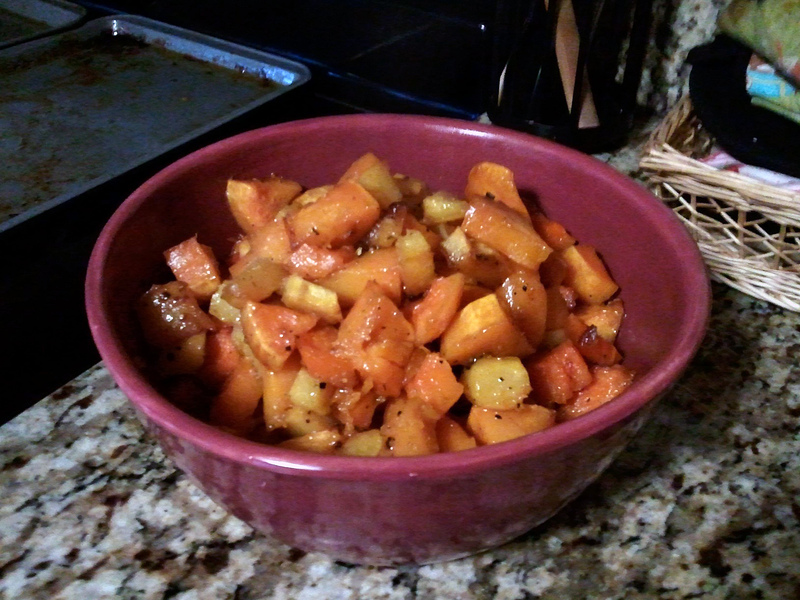 I added acorn squash to Caramelized Butternut Squash and was pleased with how scrumptious it tasted and how pretty it looked in the serving bowl. Thank you to the recipe reviews for reminding me to wear gloves when preparing the raw squash. I can be such a delicate flower sometimes. This entry was posted in Kitchen Chemistry and tagged casserole, cheese, potatoes, squash, thanksgiving on November 25, 2011 by Angerie. More chopping this week: onions, bell peppers and celery for gumbo and dirty rice. The need to acquire andouille sausage and filé powder provided an excuse to splurge on a trip to one of my favorite pricy grocery stores. Everything was fresh and from scratch except for the frozen shrimp and okra. Frozen peeled and deveined raw shrimp is a no-brainer. Deveining is a kitchen task I’m happy to outsource. As for okra, it is not a popular fall crop in the Pacific Northwest so I wasn’t really expecting to find it fresh. Here is where I make a couple of Sunday confessions. First, although one might rave about the seafood or the sausages or the spices in Cajun cuisine, the spark for this meal came from an Indian deli near my office. There is a dish in regular rotation on their lunch buffet filled with okra, chiles and spices. It is so yummy good that it made me take a second look at the odd and slimy vegetable. I am hereby outing myself as an okra fan. Any others out here? My other confession is a lie. First, I hate lying and liars and I’m mostly not very good at it. This time I lied about liver. Z was initially enthusiastic about the proposed menu but balked at the ingredient list for dirty rice. “Make it without liver,” he directed. Well, I can tell when an argument is going nowhere. I finished my list and went to the store by myself. Being generally in charge of meat preparation in our kitchen, it wasn’t hard to conceal the secret ingredient. Later, when I uncovered the steaming pot, Z said, “Smells good. What’s in it?” I tried a wide-eyed smile, “Sausage.” I’m fairly certain I saw him enjoying seconds. There is a lot of extra spice blend so I’ll be cooking Cajun again. 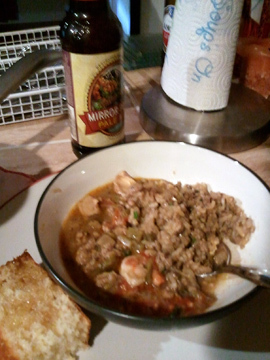 This entry was posted in Kitchen Chemistry and tagged gumbo, liver, rice on November 21, 2011 by Angerie. I like making meals that involve lots of chopping: onions, garlic, and peppers. Fresh-made salsas, guacamole and rotisserie chicken made today’s enchilada buffet a hit. The crowd favorite was the chicken enchilada with Tex-Mex gravy although I really liked the tomatillo salsa in the enchilada Suiza. After some initial skepticism from the peanut gallery regarding the utility of making making fresh guacamole and the overall amount of labor involved in the meal, doubters were won over and prepared guac was denounced by all. Besides, it’s a lot of fun to smash avocados with the potato masher. 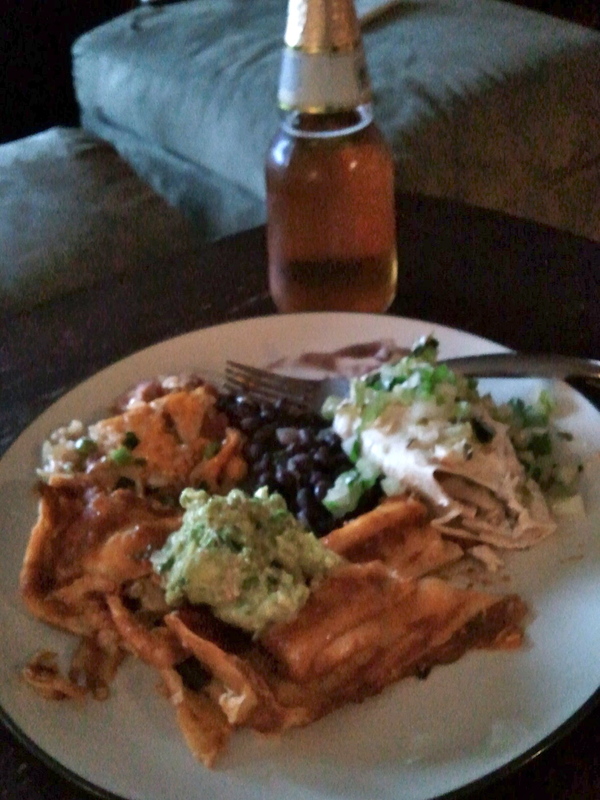 This entry was posted in Kitchen Chemistry and tagged enchiladas, guacamole on November 13, 2011 by Angerie.